Wine drinkers are becoming increasingly sophisticated and knowledgeable about wine and, as a result, much more inquisitive about the science of wine and the impact it has on our health.Wine Myths, Facts & Snobberies answers questions asked by the novice and experienced enophile alike. 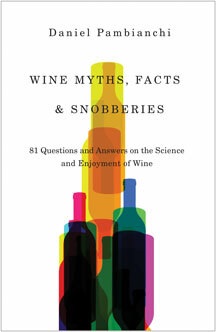 Daniel Pambianchi, winery owner and author of the best-selling Techniques in Home Winemaking,uses short anecdotes with a dash of humour to present intriguing facts about wine-debunking wine myths along the way. Authoritative and entertaining, he covers winemaking, wine service, styles, faults, frauds, the health benefits of drinking wine, and other topics. With today's wine sales and consumption far outpacing those of beer and spirits, this is a must-have book for any wine lover. 196 pp 8.5" x 5.5"